Even within the last three or four years, I have a greater ability to communicate, I think. I have more courage to show the stuff… And it does take courage. I remember feeling that. I couldn’t do, nor did I want to do, the kinds of roles I’d been doing. New Year’s Eve, we’re going to be doing a concert with the Philadelphia Orchestra in Symphony Hall. It makes me feel good, because of all the people they could have had, they wanted me! We do have to do a little work with the rhythm section. 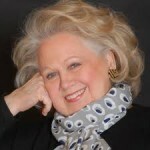 Barbara Cook is an American singer and actress who first came to prominence in the 1950s after starring in the original Broadway musicals Candide 1956 and The Music Man 1957 among others, winning a Tony Award for the latter. She continued performing mostly in theatre until the mid 1970s, when she began a second career that continues to this day as a cabaret and concert singer. She has also made numerous recordings. Cook also tried her hand at non-musical roles, replacing Sandy Dennis in the play Any Wednesday in 1965 and originating the role of Patsy Newquist in Jules Feiffer's Little Murders on Broadway in 1967. Her last original "book" musical role on Broadway came in 1971 when she played Dolly Talbo in The Grass Harp. Cook was named an honoree at the 2011 Kennedy Center Honors, held on December 4, 2011. Performers paying tribute to Cook on that occasion included Matthew Broderick, Sarah Jessica Parker, Patti LuPone, Glenn Close, Kelli O'Hara, Rebecca Luker, Sutton Foster, Laura Osnes, Anna Christy, and Audra McDonald.